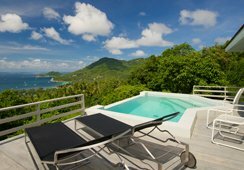 Each of our Thailand luxury villas feature spacious living areas and a large master bedroom. 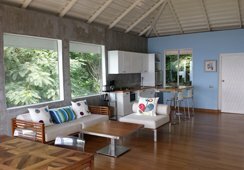 You will feel right at home so you can relax and enjoy the ambiance. 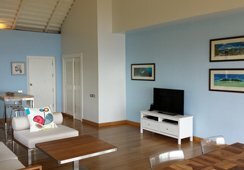 In a region where accommodation is more often tight than open, our villas offer an open and refreshing alternative. Please feel free to browse our online photos, and see for yourself! 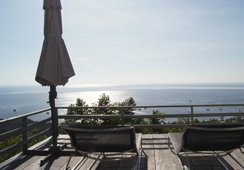 For those who enjoy the sun, you will find all you need – a spacious sun deck, comfortable lounge chairs and direct sunlight – to develop your holiday tan and to enjoy the warm tropical sun, with a beautiful panoramic view of the ocean. For those keen on cooling off a little during the day with a fresh water splash while enjoying the sun in Thailand, our pool villas are equipped with an infinity edge, private splash pool built into the sun deck. 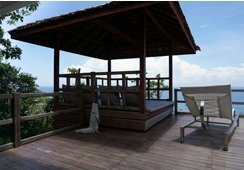 Each Koh Tao beach villa includes comforts of home, including a spacious and well-equipped kitchen, designer bathrooms with stand-up rain showers and hot water. We routinely meet our guests upon arrival. We look forward to giving you a warm welcome and making sure that you have everything you need to make your stay here comfortable and pleasant. We arrange for a taxi pick-up directly at the pier of arrival, as well as transport back to the pier following your stay. 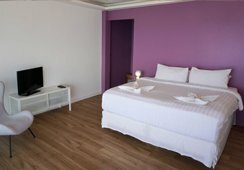 For guests who would like to make local calls, we offer a mobile phone included with the room. We stand ready to help in making special arrangements for local tours and activities, and to assist our guests as needed. We can also help you to arrange motorbike rental, to make your transport to the local villages and beaches (including the main tourist center) easy and convenient. 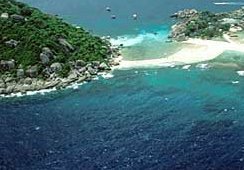 Sairee and Mae Haad are two nearby towns which offer access to beaches as well as both local and foreign-style food and entertainment. 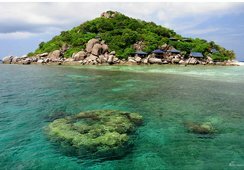 Since there are not any large crowds of tourists in these areas, you can look forward to a personal touch with the famous friendly Thai smile from the locals. 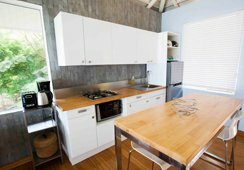 Our Thailand holiday villas feature beautiful decor with new and updated trimmings, fixtures, and appliances. 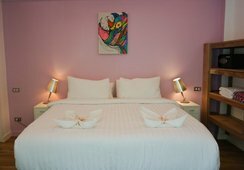 Guests have told us the bedding is the most comfortable they have had anywhere in Thailand. 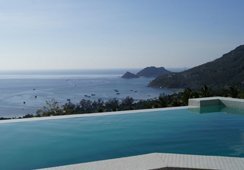 Most of all, due to the unique location of our mountain villas, you have amazing, panoramic views of the mountains and ocean, with an amazing view overlooking the famous Koh Nang Yuan island. During the day you can watch the clouds pass by, or at night, see the lights of the fishing and pleasure vessels dotting the sea. As luxury travelers ourselves, we have made every effort to ensure that your stay with us will meet your highest expectations and that your experience in Thailand will be filled with amazing memories. 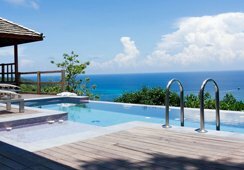 Please feel free to contact us through this website if you have any questions about our pool villas, or for any special requests - we frequently host guests celebrating special occasions such as a honeymoon, wedding, birthday, or other special times. 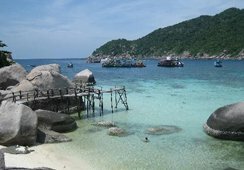 We also welcome the opportunity to give you more information about the area and to describe the local experience here in Koh Tao. We look forward to welcoming you to this beautiful corner of the world.